Statistical analysis allows us to attach meaning to data that we have collected; it helps us to understand what experimental results really mean, and to assess whether we can trust what experiments seem to be telling us. Yet, despite being a collection of the most valuable and important tools available to bioscientists, statistics is often the aspect of study most feared by students. 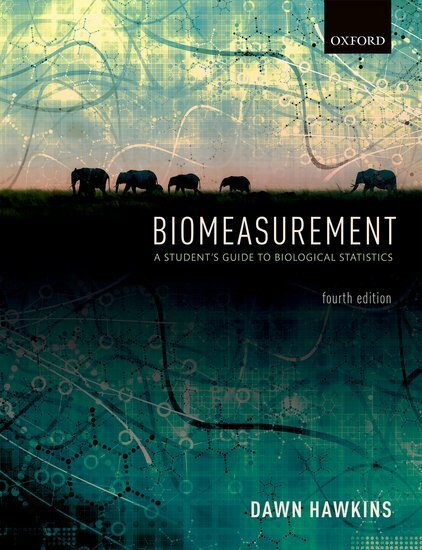 Biomeasurement offers a refreshing, student-focused introduction to the use of statistics in the study of the biosciences. With an emphasis on why statistical techniques are essential tools for bioscientists, the book develops students' confidence to use and further explore the key techniques for themselves. Beginning by placing the role of data analysis in the context of the wider scientific method and introducing the student to the key terms and concepts common to all statistical tools, the book then guides the student through descriptive statistics, and on to inferential statistics, explaining how and why each type of technique is used, and what each can tell us in order to better understand our data. It goes on to present the key statistical tests, walking the student step-wise through the useof each, with carefully-integrated examples and plentiful opportunities for hands-on practice. The book closes with an overview of choosing the right test to suit your data, and tools for presenting data and their statistical analyses. Written by a talented educator, whose teaching has won praise from the UK's Quality Assurance Agency for Higher Education, Biomeasurement is sure to engage even the most wary of students, demonstrating the power and importance of statistics throughout the study of bioscience. Online resources: The online resources to accompany Biomeasurement include: For students:* Screencast walkthroughs for SPSS and R. * Online glossary and flashcard glossary. * Data sets, for use in statistical analysis software packages. * Help sheets offering concise guidance on key techniques and the use of statistical analysis software packages. * Interactive calculation sheets to help students carry out key statistical tests quickly and easily in Excel, without the need for other software. * Full-text versions of Literature Link articles from OUP Journals. For registered adopters of the book:* Additional exercises, to supplement those in the book, and suggested tutorial assignments. * Figures from the book, available for download. * PowerPoint presentation outlines for each chapter.